Shown above: 2 Usso Club Chairs and 1 Usso Loveseat. To purchase: Scroll down and click to select the items, or call 800.343.7707. Punctuating your outdoor space with perfect precision, style and quality, enjoy the tremendous Usso Outdoor Furniture Collection from Teak Warehouse. The fog grey Sunbrella® cushions are included as shown with this deep seating collection. Call us today to order your Usso Outdoor Furniture Collection. Packing a dramatic punch, the Usso Collection with elegant Fog colored cushions is a fabulous blend of chic, traditional style with contemporary materials and color palette. 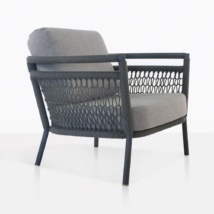 A splendid design that makes the most of a woven rope frame, the Usso Outdoor Furniture Collection is sleek, unique and eye catching. A fabulous rounded frame is accentuated by a lace style rope pattern and finished off with plump Sunbrella® cushions in soft fog, meaning that this suave outdoor furniture set looks wonderful in many settings! The Usso Furniture Range has two sophisticated pieces, the Usso Club Chair and Loveseat, enabling you to create a modest setting as well as a grand one! Create a tranquil nook on your patio with an Usso Outdoor Loveseat with two of the matching Club Chairs, the look polished off with a couple of contemporary side tables and perhaps a Sunbrella® umbrella for that shade you need on a hot summer’s day! This superb Usso Collection will look tremendous in a classic setting as well as lifting a more contemporary setting like a business or apartment block! Teak Warehouse is the leader of luxury, relaxing outdoor furniture, all of the highest quality. From the gorgeous deep seating collections such as Usso, dining furniture, shading, accessories and more, we have everything you need to make outdoor living a divine difference to your lives. The Usso Furniture Collection is made from aluminum and outdoor rope, through dyed and treated for easy use in the outdoors. With the addition of Sunbrella® cushions, you’ll adore this beautiful, long lasting set. Call Teak Warehouse today to order your Usso Collection and discover relaxing luxury in the comfort of your own home.